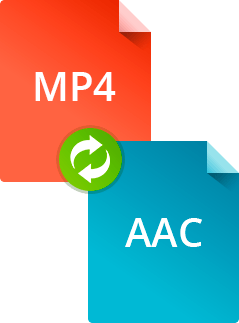 How do I convert MP4 to AAC? Movavi Video Converter is the answer! AAC (Advanced Audio Coding) is a popular audio compression format. Generally, AAC delivers better sound quality than MP3 at similar bitrates and is supported by a wide range of devices, including iPod, iPhone, iPad, PS4, BlackBerry, Android devices, and more. If you want to save the soundtrack from your favorite movie or music video and listen to it on your iPod or other device, you need some kind of conversion software. 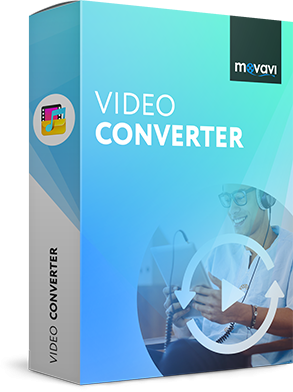 Try Movavi Video Converter for Windows or Mac – we’re sure you’ll like it! With this program, you will be able to easily change video and audio file formats. 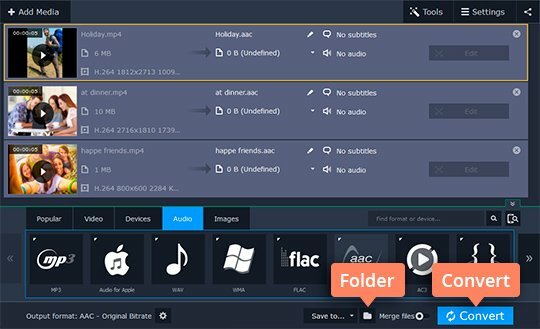 Movavi Video Converter supports AVI, MP4, WMV, MKV, FLV, 3GP, MP3, AAC, WMA, FLAC, and other popular formats. Don’t know how to convert MP4 to AAC? Just download the version of the program for Windows or Mac and follow these simple steps. Download and run the Movavi Video Converter installation file. Follow the setup instructions to install the software correctly. 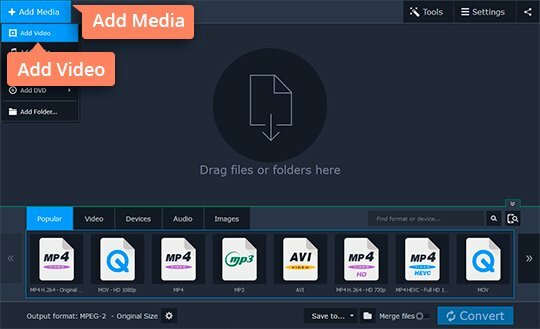 Open Movavi Video Converter. Click the Add Media button and then Add Video. Locate the files you want to convert on your computer and click Open. Select the Audio tab and choose one of the presets under AAC. You can keep the same audio settings as in the original file if you select AAC - Original bitrate, or you can choose a lower bitrate preset to reduce the output file size. Click the Folder icon next to the Save to field and specify the folder where you want the converted files to be saved. Now you can start the conversion – just click the Convert button. 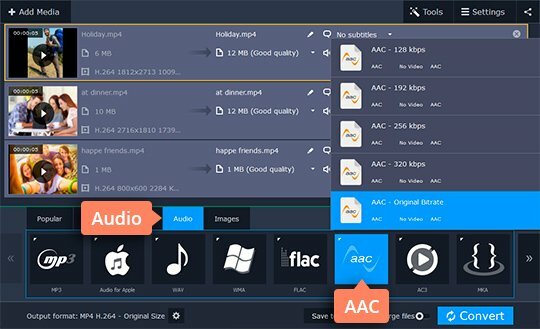 When the conversion is complete, your AAC audio files will be saved to the folder you specified, and the output folder will open automatically. Now, you can play the extracted tracks on your computer or upload them to a portable media player.